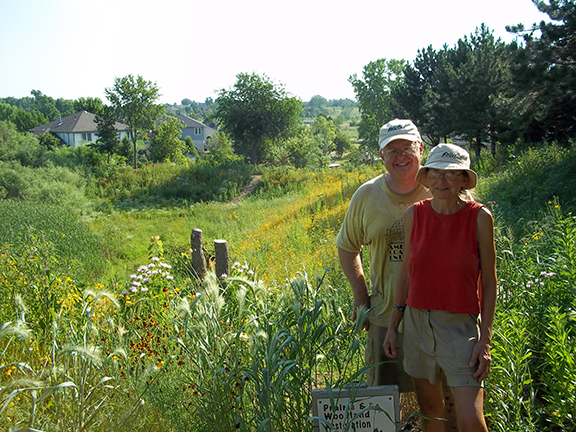 When I first visited the yard of Sandi and Parnell O’Brien in Homer Glen, they had begun the ambitious task of removing invasive buckthorn, honeysuckle and multiflora rose on their acre lot. I gave them ideas and we discussed plants that might do well in their yard. Their home sits high overlooking a small ravine and floodplain. The sloping sides of the ravine were cleared and they began the restoration project. Parnell went to the trouble of germinating the seeds for some varieties – carefully nurturing the seedlings and planting them in suitable habitat on the site. Colorful plants such as Royal Catchfly (Silene regia), Cardinal Flower(Lobelia cardinalis) and Blazing star (liatiris sp.) were intermixed with the easier to grow grasses. The day I returned to see the fruits of their labors was such a treat – walking amongst the fragrant prairie and listening to the birds! Parnell and Sandi enjoy this every day…The prairie area is absolutely beautiful, and there is an amazing diversity of bird life feasting on seeds and insects. Dozens of butterflies darted around us as we viewed the site. They had transformed the property- hours and hours of work to this point (and we all know yard work is never done), but the reward is great. Water no longer erodes the hillside, and water in the creek is filtered and drains faster with the deep rooted native plants doing what they do best. If you would like help with your yard or finding folks like Sandi and Parnell that live in your area, contact me! Conservation@Home participants are always glad to show you their properties and assist! To read more conservation stories, click here.